Scroll down the page for the railway album. 1 - Birdsong compilation, including a dawn-chorus, distant cuckoos, owls, thrush, plus sheep and lambs with spring birdsong. This track concludes with sheep and lambs calling to each other at night. 17 minutes 29 seconds. 2 - A strong breeze blowing through trees and hedges on a March morning. 20 minutes 48 seconds. 3 - Flowing water in brooks (edited sequence). 10 minutes 3 seconds. 4 - Light rain, gradually becoming heavier, accompanied by rumbles of thunder. 21 minutes 35 seconds. 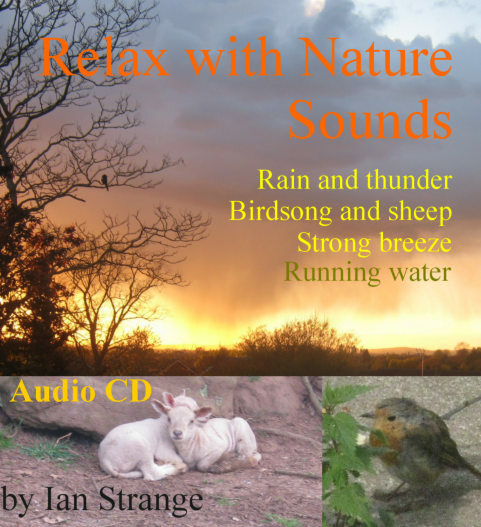 5 - FREE bonus mp3 track not on the CD album: Spring birdsong, including a woodpecker, plus sheep in the background. 11 minutes 54 seconds. 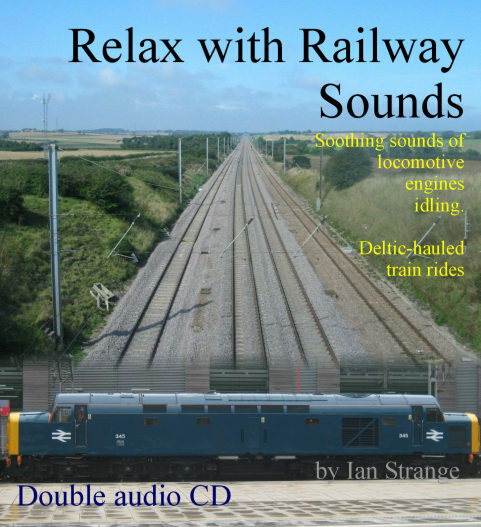 Aimed more at enthusiasts and keen rail travellers, this double album can either relax you or drown out unwanted noises at home. 1 - Class 40 "Whistler" (40145) idles at Stafford station in 2014. The rhythmical whistling of its 4 turbo-chargers is something one could listen to all day! 15 minutes 59 seconds. 2 - Class 37 (37418) idles at Crewe. With its engine 'hunting', it sounds as though it is purring - or maybe snoring! 16 minutes 0 seconds. 3 - A pair of class 56 heavy-freight locomotives (56312/311) idle at Crewe station in 2009. 16 minutes 0 seconds. 4 - A Deltic (55019 "Royal Highland Fusilier") has both of its twin-engines idling, standing outside Leicester North in 2009. The beating effect of the two engines, compliments the very smooth, unique sound of a Deltic. 16 minutes 0 seconds. 5 - A pair of class 20s (20303/304) idle at Stafford in 2009. Similar to the whistling of the class 40 above, the two engines drift in and out of phase on that very wintry morning. 16 minutes 0 seconds. 6 - FREE bonus mp3 track not on the CD album: Class 20 (D8098) idles at Quorn and Woodhouse. 14 minutes 0 seconds. Technical note: The above 6 recordings were 'looped' to provide long tracks, but done in a way that ensures you are not likely to notice. Recorded at open windows during train journeys, mostly behind preserved examples of the legendary Deltics. You will hear everything you might expect on a real journey: Rail-joint rhythm, "roaring rails" (an old track problem not often heard any more), passing trains, flashing passed bridges, etc. Note that these are fairly loud and not intended to make you sleep! But they can be relaxing if you enjoy train travel, nostalgic if you like Deltics, and perfect for drowning out noises at home. 1 - Rail-joint rhythm galore as we travel along the Settle and Carlisle line behind a Deltic (D9000 "Royal Scots Grey"). Edited highlights from one journey in February 1999, ending with a station arrival, delivering you, the listener, safely. 21 minutes 33 seconds. 2 - Riding with a classic electric loco (class 87) propelling a train departing Birmingham International and accelerating very fast towards 100mph, along welded rails. 1998. 5 minutes 15 seconds. 3 - Travelling along a line that alternates between jointed and welded rails, with a Deltic (9016 "Gordon Highlander"). Between Crewe and Kidsgrove in 2002. 7 minutes 0 seconds. 4 - An edited sequence from two journeys behind Deltic D9000, between Faversham and Didcot, in 1998 (welded rails). 14 minutes 28 seconds. 5 - Edited highlights from a single journey (Deltic D9000), mostly along welded rails, north of Oxford, calling at stations along the way, until arriving at Birmingham New Street. 29 minutes 45 seconds. 6 - FREE bonus track not on the CD: A ride onboard an HST (High Speed Train), not close to either power-car, for a relaxing on-train sound. Heard departing Crewe and building up speed. 13 minutes 33 seconds.